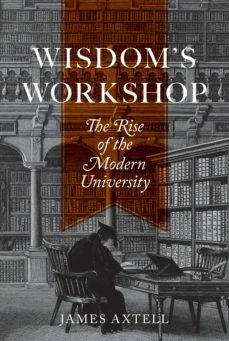 When universities began in the Middle Ages, Pope Gregory IX described them as "wisdoms special workshop." He could not have foreseen how far these institutions would travel and develop. Tracing the eight-hundred-year evolution of the elite research university from its roots in medieval Europe to its remarkable incarnation today, Wisdoms Workshop places this durable institution in sweeping historical perspective. In particular, James Axtell focuses on the ways that the best American universities took on Continental influences, developing into the finest expressions of the modern university and enviable models for kindred institutions worldwide. Despite hand-wringing reports to the contrary, the venerable university continues to renew itself, becoming ever more indispensable to society in the United States and beyond.Born in Europe, the university did not mature in America until the late nineteenth century. Once its heirs proliferated from coast to coast, their national role expanded greatly during World War II and the Cold War. Axtell links the legacies of European universities and Tudor-Stuart Oxbridge to nine colonial and hundreds of pre–Civil War colleges, and delves into how U.S. universities were shaped by Americans who studied in German universities and adapted their discoveries to domestic conditions and goals. The graduate school, the PhD, and the research imperative became and remain the hallmarks of the American university system and higher education institutions around the globe.A rich exploration of the historical lineage of todays research universities, Wisdoms Workshop explains the reasons for their ascendancy in America and their continued international preeminence.